Always well dressed, Sam Hunt poses for a professional photographer with that movie star look. Interesting and colorful character to come out of the Capone camp. His nickname says it all. It stuck to him after he is arrested many times by police who found him with a golfbag in his possession. Sam Hunt was born in Birmingham, Alabama. When he was a teenager, he ran away from home and got a job at the circus. First criminal entry in Hunt's police record shows up July 10,1919 in Birmingham, Alabama when he is fined $25 and given a six month suspended sentence on a grand larceny charge. He had accumulated several other minor charges while in Alabama. 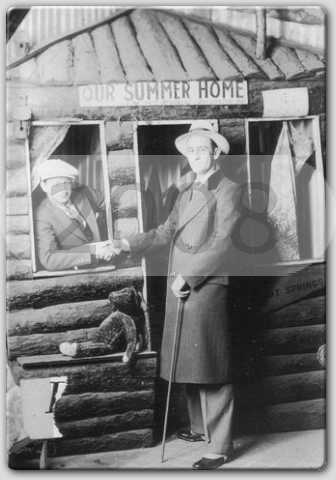 In 1920, He arrives in Detroit and stays with a cousin named Hobert Hunt. In Detroit, he works as an apprentice machinist for a tire factory. Not long after his work stint he is arrested there. After losing his job, Sam decides to move on to Chicago and try his luck. Once there, he joins up with the Capone mob. Another golfbag picked up by police. Sam Hunt is immediately suspected. 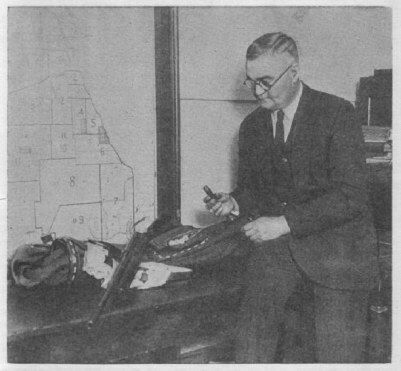 Commissioner John Stege observing shotgun and shells found in golf bag in a room on west superior street after the Hymie Weiss assassination.This is a trade mark of Capone gangsters, especially Sam Hunt. April 4,1928, Sam Hunt is released of a gun carry charge along with Clyde Bridges, James Hines, Mike Alligretti and Ralph Pierce. The guns were found in a automobile tool box. A shooting at North Ashland avenue on May 28,1930 lead police to capture Sam Hunt as he is trying to get on a car's running board to escape. In his possession he is carrying a golfbag with a loaded shotgun and a .45 pistol. He had just attempted to kill someone. Proof of which showed shotgun blasts that peppered the front facade of a building 5301 North Ashland avenue. Search in the building find some empty alcohol bottles. One tenant is believed to have been a minor bootlegger Hunt was trying to intimidate out of business. Some teenagers were around the area and one testified that a man had half his face blown off before being thrown into the car's back trunk and driven off. Hunt himself was taken off the escaping car's running board by police. It was first reported that Hunt's target might have been Moran lieutenant Leo Mongoven, who might have been living there. In questioning Hunt, the police learn that he is working for Mike"Bon Bon" Allegretti, a manager for Ralph Capone at the Cotton Club. Later investigation show that Eugene"Red"McLaughlin's mother lived not far from the attack.It is merely speculative that Hunt may have been hunting for Red. McLaughlin's body was later found weighted in a canal and he had been missing before the mentioned Hunt attack. August 4th,1930, a new clue is found in the Jack Zuta murder when a golfbag along with some shotgun shells are found in the woods near Delafield.The authorities immediately suspect Sam Hunt. 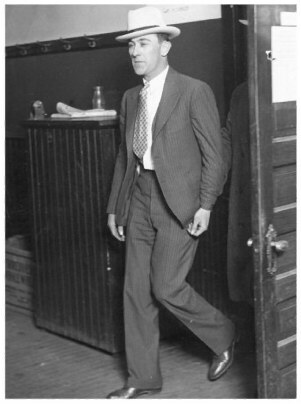 Sam Hunt entering police station after being arrested for vagrancy by detectives at 79th street and Exchange Avenue in South Chicago on November 9,1930. Never does prison time for any murders, Hunt is sentenced in 1931 for 90 days in Bridewell and fined $100 for defacing identification on a revolver. Ralph Pierce and Sam hunt clowning around in Hot Springs. Mr. Ralph Pierce was born in Ohio on June 12,1904. He was the son of William Pierce and Amanda Stewart. Always into trouble, he gravitated on to Chicago to become the Capone gang's intimidator. Used mostly as a bodyguard for others, Pierce's role in the gang developed through his demonstration of loyalty and money making abilities. He was also used in voter terrorizing when the Morris Eller faction would kidnap opposing 20th ward candidate workers and hold them at gunpoint till the election win was in the bag. Pierce was identified as a Capone gang member backing the Eller clan, and the so called "America First" ticket. Morris Eller was City Collector and his son was Judge Emmanuel Eller. They were in battle for votes against the Charles Deneen camp. Pierce criminal roecords had him charged with robbery, assault, assault to murder and Kidnapping. He was accused of murders, racketeering, vote fraud and overseeing gambling and prostitution for the South side Capone gang. Often arrested together, Pierce became fast pals with Sam Hunt when they were first arrested side by side on April 2,1928 near Cicero for gun toting along with Clyde Bridges,James Hine and Mike "Bon Bon" Allegretti. Hunt was the only one who could get deep under Pierce's skin as a joke and get away with it. Pierce had various jobs in the gang. His main job was chauffeuring and protecting Murray "The Camel" Humphreys. 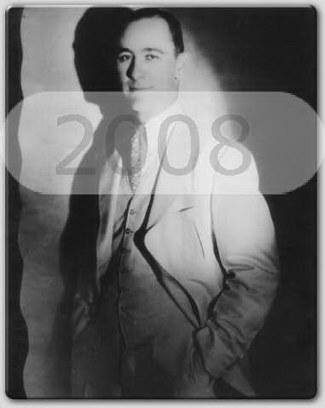 He was arrested on January 31,1930 with Murray Humphreys in a room at the Paxton Hotel. Both had guns and Humphreys tried bribe the Detectives with $1000 for their release. The Detectives refused. Ralph Pierce was suspected at that time to have robbed $1000 from a Private Bank. No proof was brought forward on that charge. 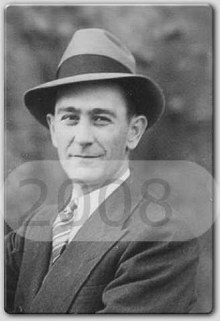 In 1933, the now Capone associate Ted Newberry is killed. Ralph Pierce and Sam Hunt are seen motoring in the area where Newberry's body had been found. Pierce had a nice wide and bright smile that quickly turned into a life threatening demeanor as was once shown against Georgette Winkler and later on Louis Greenberg. 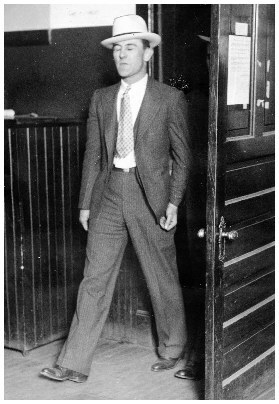 Greenberg was a brewery owner who was killed on December 8,1955, after being a Government witness in a 1943 New York trial against Chicago gangsters involved with the movie industry extortion. After testifying, Ralph Pierce leans over and snarls at Greenberg telling him ,"You ---- we'll take care of you!" Pierce wasn't known for his indepth vocabulary, as his conversation was limited to few words and short sentences. Pierce, as with Hunt, had friends in politicians and police officials. Both had a love and hate relationship with them, as the politicans and police officials never acknowledged this hidden friendship with the gangsters. 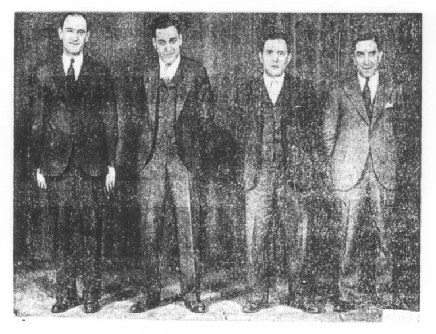 From being his bodyguard, Pierce had rose to equal standing next to Humphreys and later took over his Roosevelt Road gambling operations when Humphreys died in 1965. Black street gangs later coveted Pierce's operations forcing him into semi retirement. He still dresses to nines and touts himself as being an Investor. He is married to a woman named Dorothy Lind. Pierce dies of a heart attack on July 2,1976 at the South Shore hospital where he had been in intensive care for weeks. He was 72 years old. He is laid out at the Donnellan Funeral home at 7651 South Jeffery Blvd. and is buried at Oakwoods cemetary. In 1933, Hunt is sentenced to one year in Bridewell and fined $300 for vagrancy and carrying a concealed weapon. September 1935, Sam Hunt and Steve O'Donnell were arrested at a Constitution day celebration in Chicago Stadium. Vendors there had been complaining that Hunt and O'Donnell had been assaulting them for refusing to pay 50 cents a night to a newly organized "union". They were freed after the charges were dropped. The closest Hunt ever came to serving time for murder (non gang related) was on July 4,1942 , when a Southside fender bender with an African American lead Hunt to pull out a gun and kill Michael Wade and wounding his friend. Hunt is also wounded, probably self inflicted with friend's gun. After four trials, Hunt is freed. Hunt would have faced a minimum 14 years in prison if he was found guilty. Hunt's friend Hy Godfrey would claim that Michael Wade shot Hunt and then himself in a suicidal rage. 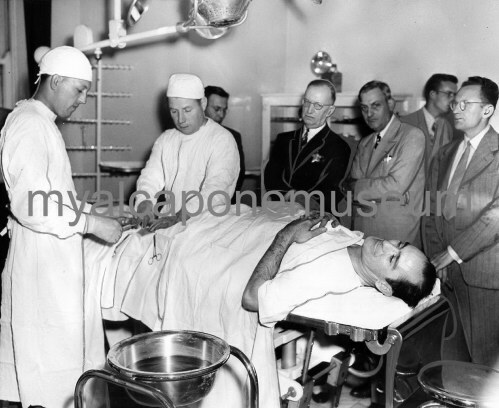 August 6, 1942, Sam Hunt on the operating table surrounded by doctors and detectives. He was operated on to see if the bullet lodged in his leg was indeed from the victim whom Hunt shot and killed in a fender bender. In 1951, Hunt is indicted with Thomas Manno, Marvin Fishman and Milton Winfield Jr. on a charge of conspiring to operate policy games. Hunt is identified as a manager. A mistrial lead Hunt to be freed from the indictment. The Erie Buffalo policy wheel is one of the largest on the southside and rakes in $280,000 for Accardo and company. The policy wheel had been owned by the Benvenuti brothers. (Leo, Cesar and Julius). Julius had died.Cesar and Leo were muscled out when their homes were bombed by the syndicate in 1945. June 12,1951, Fifty four year old Hobart Hudson is found dead in Hunt's apartment at 1722 E. 70th st.
Sam Hunt explains to police that Hobart is in fact his brother. Hobart had been a motion picture operator and died of natural causes. Hunt maintains other living quarters in Chicago such as 2223 E.68th st.
September 17,1952 Sam Hunt and his then wife Lois where arrested on a variety of traffic charges. Police are constantly harrassing Hunt and pick him up on site. Chief Justice Joseph A. Graber chastizes the arresting officers for making sham arrests and wasting the courts time. He tells them to do better police work and come up with real charges. Hunt is again set free. 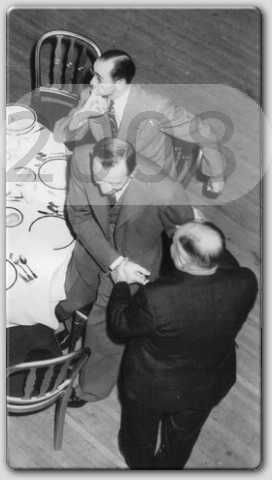 Sam Hunt sitting and his buddy Ralph Pierce being held by unidentified man at Tony Capezio's daughter's wedding reception. Sam Hunt (Left) with Jimmy "Diamond" Moran in New Orleans. Moran was a well known restauranteur whose real name was James Brocato. Diamond was his knick name because he loved Diamonds so much, that pratically everything he owned was encrusted with diamonds. Starting off as a shoeshine boy, he later became bodyguard for Huey P. Long the Louisiana Governor. He had been involved in slot machines with Frank Costello and also the racing News wire service. Moran dies of a heart attack in his restaurant April 13,1953. 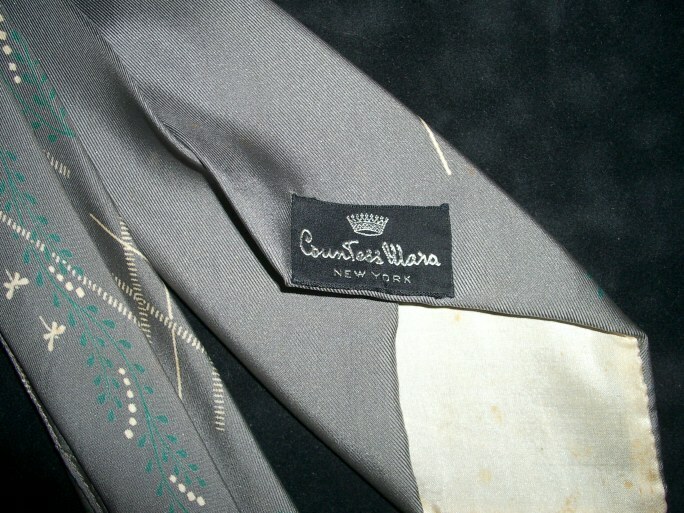 Sam Hunt's personal favorite Countess Mara silk tie. 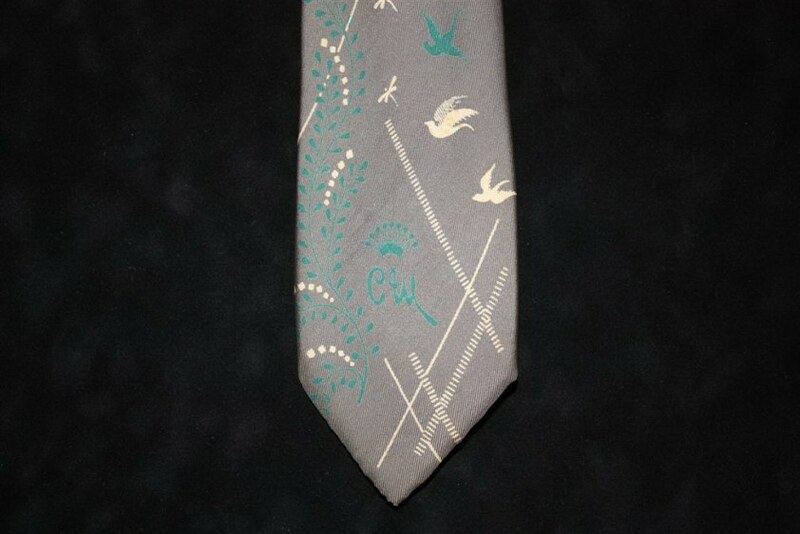 Sam Hunt was one classy dresser as his personally owned tie can testify. 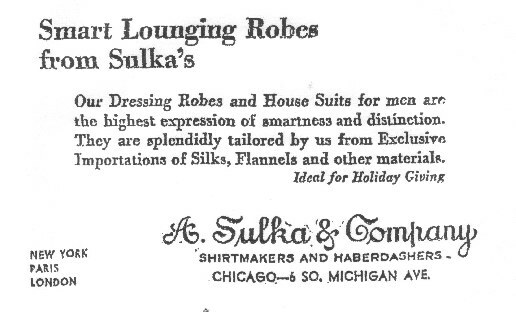 Mr. Hunt and the Capone crew did most of their oufitting at A. Sulka haberdashery. 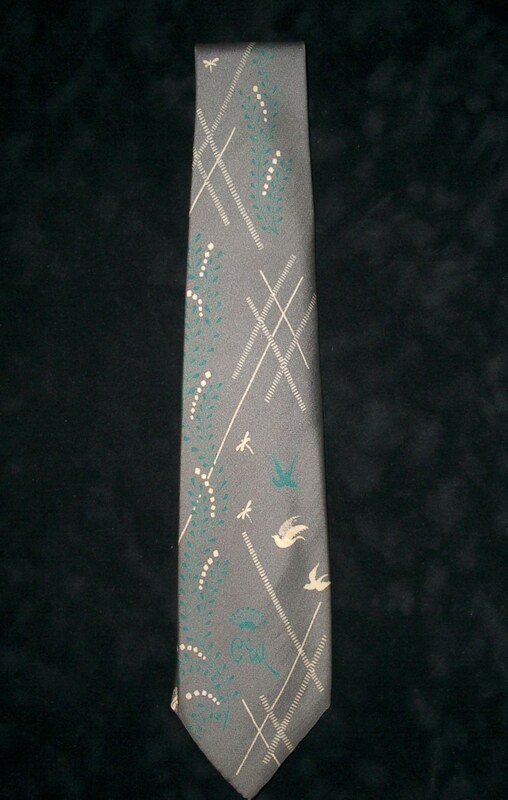 Close up of dragonflies and doves design with CM logo. Sam had fell in love with, and married a dancer named Pat Conway, who had bore him his daughter. 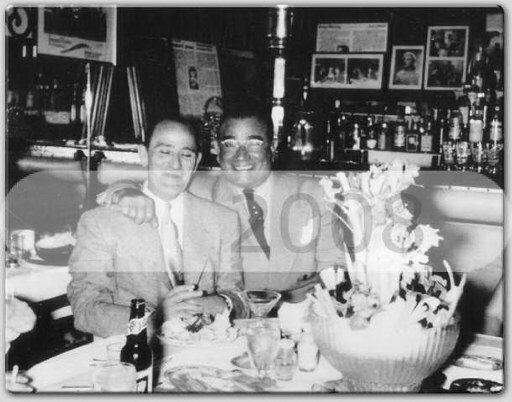 As with most of the Capone gangsters, Sam was a loving father and husband. Always made sure his family was well taken care of, had a nice residences, cars and even a maid. He showered his only child with gifts and spent as much time as he could even when the divorce took place. Many friends dropped by the Hunt household, especially during Sunday breakfast. Mob stuff as with the other Capone members was strictly hush, hush. Hunt was a fiercely loyal man to his friends and family. He had a hard time accepting authority because of all the corrupt officials he encountered in Chicago. Most of these judges, police and detectives were friends with Sam, and yet claimed not to know him when he was in trouble. One particular talent of Sam, was that he was quick to make people laugh and had an uncanny ability to imitate / mimick people. He used to like to tease his old pal Ralph Pierce by calling him pucker or pucker mouth. This was because Pierce was a real sore loser at card games. After prohibition, Hunt continued with policy rackets, horse betting and lived prosperously in Coral Gables with his daughter and her family. He became one of the few Capone gangster elders who still commanded respect along with Accardo, Maddox, Humphreys and Capezio. Although life being what it is, Sam and Pat get divorced in 1943. He had later re-married to a woman named Lois, which also ended in divorce. 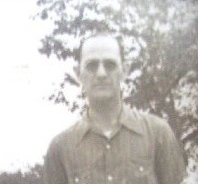 Sam Hunt died on August 19,1956 in a Schenectady, N.Y. hospital. He had been suffering from heart disease for some time and had been visiting family in Schenectady for three weeks when pneumonia hit. As a child, Sam had suffered from rheumatic fever, this along with smoking, probably would have been the principal cause of his early demise. His body was shipped from New York and his funeral was held August 23,1956, in Birmingham, Alabama. 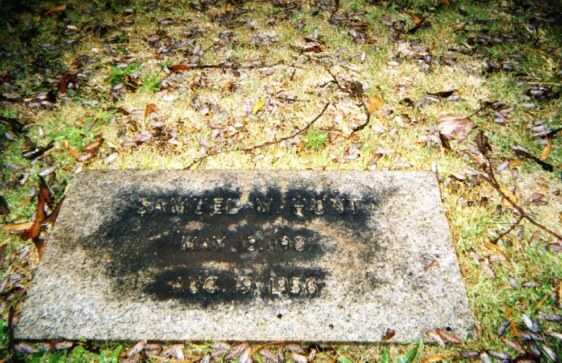 His remains are buried alongside his parents in the Elmwood cemetary, Birmingham, Alabama. The Hunt family monument in Alabama.